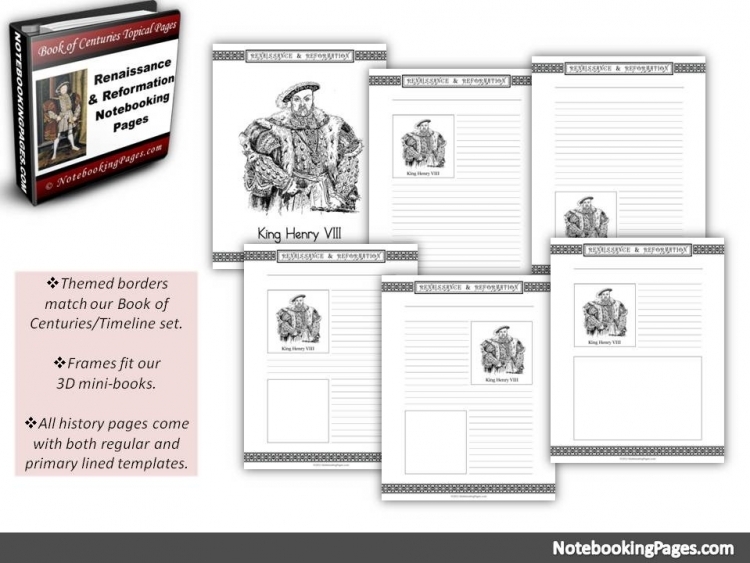 These homeschool history Renaissance resources will help the family prepare for the study of the Renaissance and the Reformation. Here you will find resources which the parent/teacher will want to reference, use as a thread book as well as pass on to the older students as good reference materials. Further on the page, you will find Historical Sources - places where the students can read the primary source material as they pursue a deeper understanding of this time period, such as The Canterbury Tales, Le Mort d'Arthur and The Travels by Marco Polo. 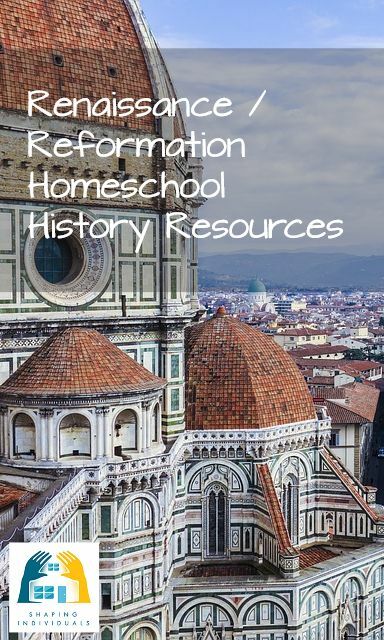 This page only deals with the teacher resources and the primary resources to help you teach homeschool history Renaissance and the Reformation. 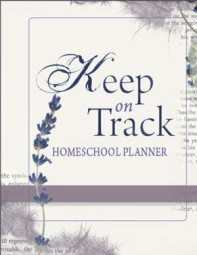 For more homeschool history resources, ideas, living books, hands on project ideas, history curriculum and spine books especially for this time period - click on the links at the bottom of the page. 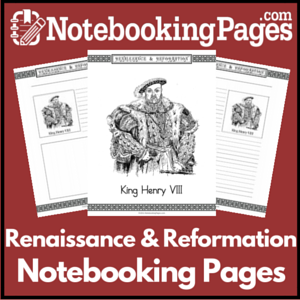 This will direct you to the appropriate homeschool history section for the Renaissance and Reformation. 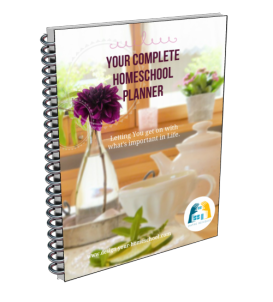 Every teacher needs their tools and as far as homeschooling parents, the tools we need are books. Reference books will help you as a teacher / parent understand this time period and will also help you guide your children in discussing the relevance and impact of this time. We have enjoyed these resources and found them inspiring. How Now Shall we live by Charles Colson is such an incredible book for parents and young adults. How Now Shall We Live? encourages readers to present the gospel in a way that will capture the imaginations, minds and hearts of a culture that is entrenched in the lies of relativism and self-before it's too late. Both volumes of Streams of Civilization are excellent homeschool history reference books. We have also used this series with our older children as their own spinebook. They have read and summarized from this book as well as used this to write essays and do extra research work. This book begins with this time period. For the Renaissance/Reformation, you will need Streams of Civilization Volume 2. Covering all the time periods and a worthwhile resources for the whole family is the Kingfisher History Encyclopedia. The next two titles help to study the literature of the time period. An excellent introduction to one of the world's greatest literary masters! Offering a Christian interpretation of Shakespeare's works, Leithart examines the biblical overtones found in six of the Bard's best-known comedies, tragedies, and historical plays. Thought-provoking study questions, suggested essay topics, and informative reviews of film versions of the plays appear at the end of each chapter. 286 pages, softcover from Canon. The Discarded Image paints a lucid picture of the medieval world view, providing the historical and cultural background to the literature of the middle ages and renaissance. It describes the 'image' discarded by later years as 'the medieval synthesis itself, the whole organisation of their theology, science, and history into a single, complex, harmonious mental model of the universe'. This, Lewis' last book, has been hailed as 'the final memorial to the work of a great scholar and teacher and a wise and noble mind'. To get involved completely in the time period, your older teens will benefit from reading and studying these primary sources. Reading the very words of Marco Polo in his Travels and reading the remarkable account of the life of the King, Alfred the Great written by Asser, a monk in his service, provides a wealth of information which is unique because it is written at the time by eye witnesses, not a third hand account. The reign of King Alfred the Great (871-99) is among the most stirring periods of English history. As king of Wessex, he strove to emulate those kings of the past who, in his own words, had 'succeeded both in warfare and in wisdom.' He led the battle against the Viking invaders of England, and presided over the revival of religion and learning among his people: his reputation is a measure of his success. Asser was a monk of St. David's, in Ales, who entered King Alfred's service and eventually became Bishop of Sherborne. His Life of King Alfred, written in 893, is a remarkable account of the king's activities in peace and war, and testifies to the admiration that Alfred inspired in those around him. The legends of King Arthur and his knights of the Round Table have inspired some of the greatest works of literature - from Cervantes's Don Quixote to Tennyson's Idylls of the King. Although many versions exist, Malory's stands as the classic rendition. Malory wrote the book while in Newgate Prison during the last three years of his life; it was published some fourteen years later, in 1485, by William Caxton. The tales, steeped in the magic of Merlin, the powerful cords of the chivalric code, and the age-old dramas of love and death, resound across the centuries. The stories of King Arthur, Lancelot, Queen Guenever, and Tristam and Isolde seem astonishingly moving and modern. Malory's Le Morte d'Arthur endures and inspires because it embodies mankind's deepest yearnings: for brotherhood and community; a love worth dying for; and valor, honor, and chivalry. In The Canterbury Tales Chaucer created one of the great touchstones of English literature, a masterly collection of chivalric romances, moral allegories and low farce. A story-telling competition within a group of pilgrims from all walks of life is the occasion for a series of tales that range from the Knight's account of courtly love and the ebullient Wife of Bath's Arthurian legend to the ribald anecdotes of the Miller and the Cook. Rich and diverse, The Canterbury Tales offers us an unrivalled glimpse into the life and mind of medieval England. Nevill Coghill's masterly and vivid modern English verse translation is rendered with consummate skill to retain all the vigour and poetry of Chaucer's fourteenth century Middle English. Despite piracy, shipwreck, brigandage, and wild beasts, Polo moved in a world of highly organized commerce. This chronicle of his travels through Asia, whether read as fact or fiction, is alive with adventures, geographical information, and descriptions of natural phenomena.